Log into My Account and click on the reorder link to the right of the project. On the left side of the page, select the options that apply to your changes. An upload page will open on the following pages, allowing you to upload new files. 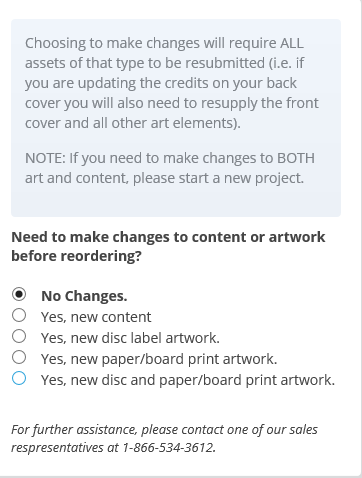 **Note - if you need a new master for this project, you will not be able to submit new artwork also. This would be considered a new project. Create and save a new quote with a new naming convention so that the two projects do not get confused.